The SIBEX experiment was a collaboration between laboratories and universities of Italy and UK as part of the LIMS (Limb Infrared Monitor of the Stratosphere) satellite validation campaign. Under this collaboration, the National Physical Laboratory, Teddington, UK provided a stabilized gondola and a cooled grating spectrometer operating in the middle infrared, while the Italian part provided the main experiment, called Infrared balloon experiment (IBEX). 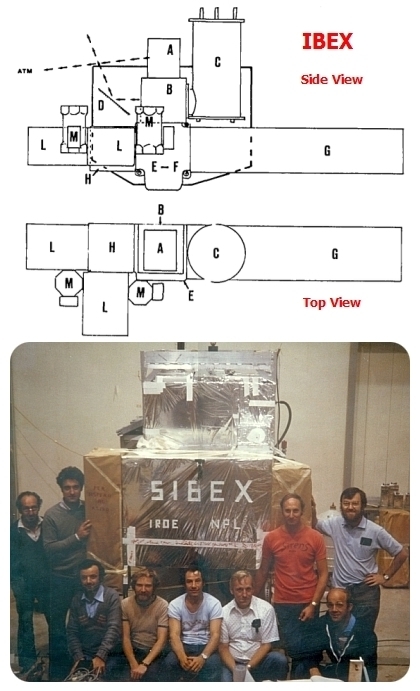 IBEX was a high resolution Fourier Transform spectrometer designed in the decade of the 70s which operated in the far infrared spectral region to perform limb sounding measurements of atmospheric trace species concentration from a stratospheric balloon platform. It was flown twelve times in different configurations/collaborations until its last flight in 2002. The IBEX basic layout is shown at left (top) while the fully integrated gondola during one of the flights is shown below (picture by Dr. Bruno Carli). The atmospheric signal was acquired by mirror A, which pointed the atmosphere at different preset zenithal angles near the atmospheric limb. The input polarizer B transmited in a polarization plane parallel to its principal axis a linearly polarized component of the atmospheric signal from A and reflected in the perpendicular plane a component of the reference signal entering from the second input port C (or D). The polarizing beam splitter E has its principal axis at 45º to that of B. So both linearly polarized beams from the input polarizer were split into two equal amplitude beams; one transmitted to the fixed mirror F, the other reflected to the moving mirror G. F and G were 90º roof mirrors which overturned the reflected image around an axis parallel to the roof edge without introducing an appreciable dichroic effect (in the case of far-infrared radiation). Thus if the roof edges were at a 45° angle to the principal axis of the beam splitter, both the images and the polarization planes of the beams emerging from the beam splitter were rotated by 90º by the reflection on F and G. When reaching back the beam splitter, one of the two beams was reflected and the other was transmitted toward the output polarizer H with a 100% efficiency in a perfectly aligned instrument with perfect polarizers. Furthermore, the two orthogonally polarized components of both the atmospheric and the reference signals have traveled different paths and when recombined through H will give rise to the desired interference. The instrument was built in a modular arrangement of magnesium cast boxes. Magnesium was chosen to limit the weight despite the large dimensions of the instrument. The boxes could be made airtight to evacuate the instrument both for calibration purposes and in view of laboratory measurements. The purpose of the flight was to obtain simultaneous limb sounding emission measurements of the atmosphere from the same gondola for the detection of the vertical profiles of minor constituents responsible of ozone depletion. After a first electronic failure that prevented the succesful mission during the first flight of the campaign on 29th October, which was corrected after post-flight investigation, a total failure of the entire telemetry system occured in this second flight. Further investigation revealed that there was an error in the wiring list where a pin in the interface connector was listed as having no connections. The scientist used this pair for an unused ground wire in his cable. That pin actually had 28V from the transponder so when the transponder was commanded on, the main voltage to the package was shorted. The mission was carried out -this time succesfuly- on November 17th.